Looking back at my last entry those many months ago, it helps remind me of just how thrilling and fulfilling playing rec league hockey can be for the never-weres of the sporting world. We take our victories where we can and it raises us up. The PuckHawgs took that summer championship in a game that was never in question and so we moved up a division the following season. Now in our second season in Upper 'C', the wins aren't as easy to come by and after falling in round 1 of the playoffs, our second campaign has begun. There's a few new faces since our championship season but the core of the team remains and I can't imagine the thrill of us getting to the championship game in this higher division. Stay tuned. Speaking a little goalie stuff for those interested... I've been marking down the shot types that have the highest frequency of goals against me and found one of which I was painfully aware but a second that surprised me. The one that I've been working on with my coach is the shot from the right side (my left) half boards. I get off my angle here so often and, depending on if the shooter is a lefty or righty, more than a little bit. I'm getting beat stick side low for no other reason than I'm failing to keep my angle as the shooter drifts further down to the net. I'll keep working on it but right now I am hyper-aware of it and my confidence is suffering on that shot. The other goal that is piling up on me is the short side, bad angle shot. Its completely a technique problem where I am failing to make a good seal against the post. Let's face it, when the shooter is in tight on that angle and I'm squared up, at my size there should be almost no net to shoot at. Instead I'm leaving a gap on that short side and its costing me. Its my belief that this is a long-standing habit of mine that wasn't exposed until I started seeing a higher level shooter in higher level divisions. I think lower skilled players have a much harder time with that small an opening and the few that got by me never caused me much to think about. By the way, I ignore breakaways, two-on-ones and deflections from the mix, That's the defense's problem. I continue to have a blast skating out as a forward on a few teams. I finally ditched the wooden sticks (R.I.P. Sherwood PMP) for some flexy new things that have put a lot more zip on my shot. 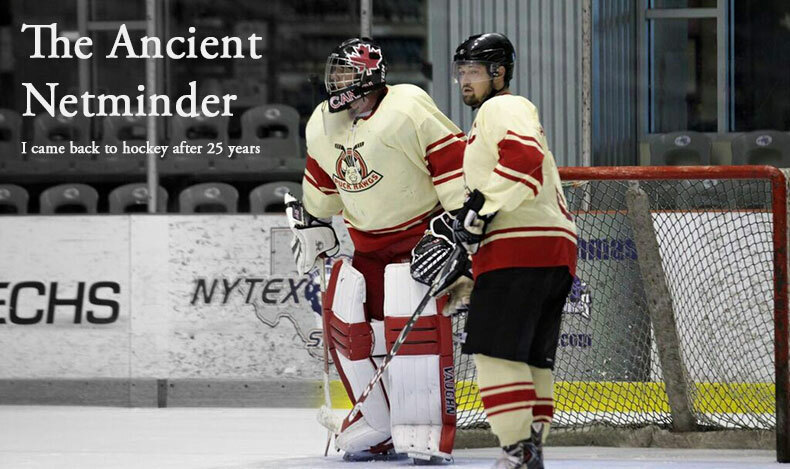 [visit zealhockey for info or contact Jonathon A. if you are in the DFW area] For reasons unknown to me I seem to have a knack for goal scoring. Very few of them are pretty and fewer still come off the rush but I find myself in the right place at the right time a lot and it results in some scoring chances. I'm often asked if its because I play net that I know where to go and the answer is really, no. I do think knowing the tendencies of beer league goalies helps when it comes time for the shot though. I'm keeping that to myself. While I have no expectations of moving up divisions as I have in net, I am having nothing but pure fun with the freedom of skating as a forward. I've gotten to know a lot of goalies in DFW and some that have come to it since I came back three years ago. It's fascinating to watch adults- most far younger than me, start their own journey. Some struggle and others are rocketing right past my own skill level in a short amount of time. There exists a very real kinship with your fellow goalie no matter their own skill or yours. I try and help those that ask and I am appreciative of those who give me time. In all cases, its just another example of why hockey is the greatest sport even for those of us who only play at 11pm on weeknights. Life has been hectic and sometimes a challenge this past year and I've fallen out of the habit of writing down the latest on my journey. I want to thank those that take the time to remind me to write and thank all of you who support it by reading. I'll do better. I promise.